Twenty years ago,the German doll artist, Annette Himstedt launched a new movement in doll making with the introduction of her life-sized vinyl "Bare Foot Children" series. Since then, she has become known as one of the world's most talented and influential doll artists. Drawing her inspiration from children she has met, Annette Himstedt continues to delight collectors with her amazing ability to capture the unique spirit of a child. 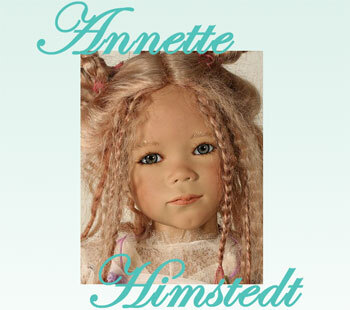 Annette Himstedt dolls are always exquisitely detailed. Whether they are laughing, frowning, cheekily smiling, or pensive, the emotion of the doll just jumps out at the viewer. The collector's response to the beauty and naturalness of these dolls has ensured that her past editions continue to be in constant demand.